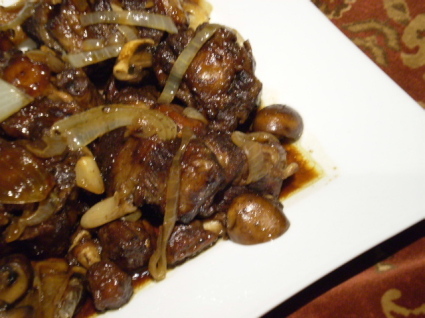 Beef oxtails, considered by many a lesser cut of meat, are rendered tender and delicious by long, low, slow cooking. The uniquely shaped tail segments house “lobes” of meat that are succulent and flavorful, and can be accented by many cooking methods. This traditional braise relies on the familiar flavors of garlic and onion, and is underscored by asian touches of ginger, soy and five spice powder. Bring a medium stockpot of cold water to a boil. Add oxtails and bring to a boil. Cook for two minutes and drain. 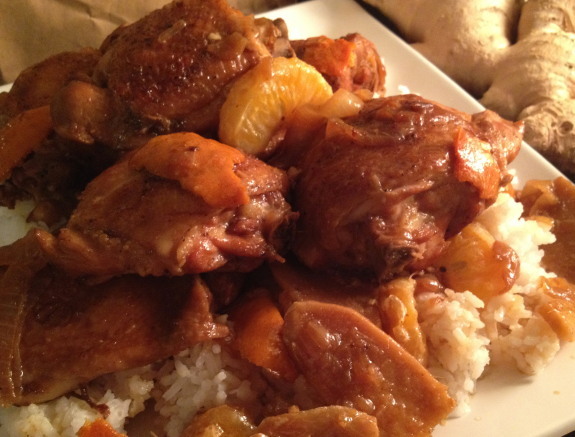 Rinse oxtails with cold water in a colander. Pat oxtails dry with paper towels, then season with salt, white pepper, garlic powder, five spice powder and 1 tbl each dark and light soy sauce. Toss to coat. Heat oven to 350. Heat a large dutch oven over medium high heat. Add olive oil and cook oxtails, turning to brown evenly, about five minutes. In a medium bowl, combine chicken stock, worcestershire sauce, red wine vinegar, remaining soy sauces and oyster sauce. 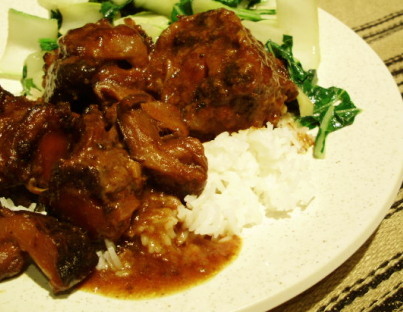 When oxtails are nicely browned, add ginger slices and liquid mixture. Bring to a boil. Cover, reduce oven to 325 and cook for two hours. Check liquid after one hour, adding more chicken stock or hot water to maintain one inch level. 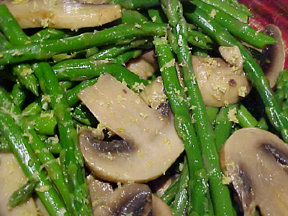 After two hours, add garlic, onion, mushrooms and cover. Cook for 45 minutes to one hour more or until meat is very tender and pulling away from the bone. 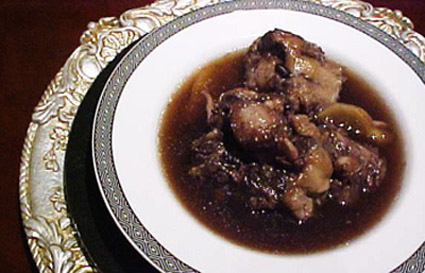 Remove oxtails to serving dish. Pour liquid into tall vessel and skim fat. Check juices for seasonings. 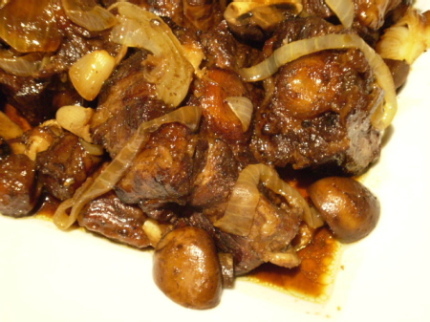 Spoon garlic, onions and mushrooms over oxtails and pour juice over all.